Today, the Trump-Pence administration took its latest step to restrict and withhold resources from providers and clinics that provide abortions or refer patients for abortion care. Congress and many state legislatures already currently withhold nearly all public health coverage for abortion, creating unjust obstacles to care for those struggling to get by and severely restricting their ability to get abortion care. The forthcoming rule would take away resources for birth control, STI screenings and prevention, cancer screenings, and other lifesaving care, with devastating consequences for women. 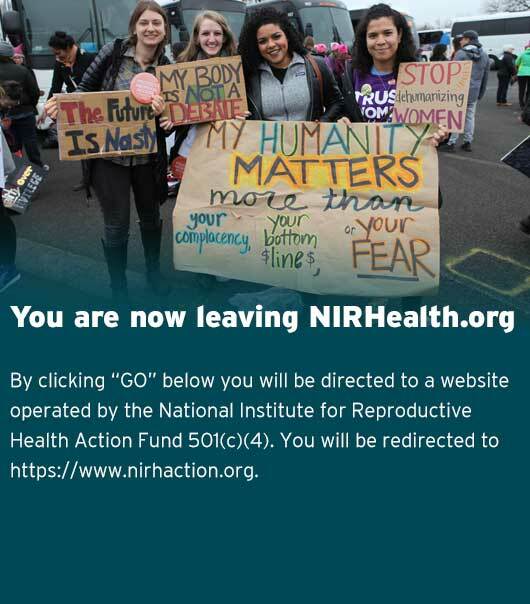 The National Institute for Reproductive Health (NIRH) urges the administration to rescind its reckless decision – and pledges to work with cities and states to find creative ways to use their resources and powers to mitigate the harmful effects of this rule going into effect. “We are appalled by the Trump-Pence administration’s latest reprehensible attack on women’s reproductive health, rights and justice. The impending gag rule is a blatant attempt to push not only abortion but the full range of family planning care out of reach. It would deny women the right and ability to access medically accurate information from trusted health care providers and leave many without access to the abortion and contraceptive care they need. “Clinics that rely on federal funding are often the only providers of reproductive health care in their communities. The unconscionable burden of the Trump-Pence administration’s decision would fall hardest on women who already face tremendous barriers, particularly low-income women, young people, and women of color. State and local leaders must act as a bulwark in the face of the Trump administration’s unprecedented attack on women’s health care.